It is interesting to see some of the "smart money" beginning to position themselves for an eventual inflationary spiral. While I believe we are in a somewhat deflationary period right now with excess capacity in almost everything, and even signs of pressure downward on wages - the eventual bet is Helicopter Ben Bernanke will turn into B52 Bomber Ben and drop so much fresh US currency on the world that it will force inflation. Deflation is the fear of the U.S. power elite as it erodes their assets; and history has shown once you go into full blown deflation it is a very difficult thing to reverse. So the bubble makers at the Federal Reserve would much rather deal with the 'evil' they are familiar with - inflation. If you are not familiar with John Paulson, he mopped up the hedge fund industry in 2007 and 2008 with bets against subprime loans and financials. In 2007 alone he PERSONALLY earned $3 Billion [Apr 8, 2008: Hedge Fund Manager - Good Work if You can get It] While most people were busy reading Buffet's year end letter I was more interested in what Paulson had to say [Jan 31, 2009: Dealbook - John Paulson's Year End Review] Due to the size of his funds it is not so easy as it once was for him to move in and out of markets but his forays into gold are now joining his moves to begin snapping up mortgage backed securities [Nov 18, 2008: Paulson Buying Mortgage Backed Securities] which I expect to be another huge win for him. If you can buy these things at the right price and run the correct analytics (full time staff required!) there have to be extreme dislocations between current prices (often held by very distressed sellers) and actual long term value. We'll probably know by 2011 how that bet turned out. 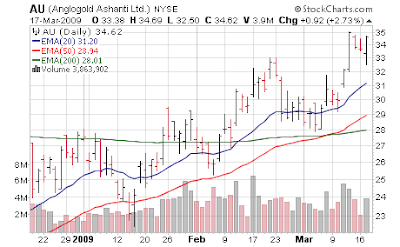 Back to the gold side, another prominent hedge fund manager - David Einhorn has also joined the fray buying gold more directly through the well known ETF (GLD). Einhorn is more of a deep value type of manager so once again both these guys are looking not out one week or one month but I'd assume much farther out. By the way, if you were not reading the blog back in January I'd recommend a quick jump here to read an excellent opinion piece by Einhorn and Michael Lewis on what so ails the financial system and how to fix it [Jan 5, 2009: New York Times Opinion Piece by Lewis and Einhorn] Einhorn did not have a great year in 2008 but called famously called out Lehman Brothers (LEH) very early. Paulson & Co., the New York-based investment firm run by John Paulson, bought a stake in AngloGold Ashanti Ltd. (AU) from Anglo American Plc for $1.28 billion as hedge funds increase their gold holdings. Paulson paid $32 a share for the 11.3 percent stake in the Johannesburg-based gold miner, Anglo American said today in a statement. The purchase makes Paulson the company’s second- largest shareholder, according to data compiled by Bloomberg. 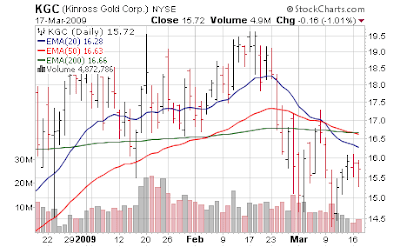 Paulson also owns a 4.1 percent stake in Kinross Gold Corp (KGC)., making the hedge fund the fourth-largest holder of the gold producer. Hedge funds are turning to gold to mitigate potential inflation as governments around the world increase spending to stimulate their recession-bound economies. David Einhorn, founder of New York-based Greenlight Capital Inc., told investors in January that he is buying gold for the first time. Hayman Advisors LP’s Kyle Bass said investors are seeking precious metals as central banks print more money. “Hard currency is coming to the fore, as evidenced by the investment choices of some of the world’s most seasoned investors,” AngloGold Ashanti Chief Executive Officer Mark Cutifani said today in an e-mailed statement. AngloGold is reducing contractual commitments to sell gold at fixed prices so as to secure more room to benefit from earning spot-market prices. The gold producer, whose biggest mines are in South Africa, also is benefiting from declines by the rand because it pays most of its costs in the currency and sells gold for dollars. Now, I won't pretend to know much about AngloGold Ashanti (AU) but obviously the "important people" got wind of the transaction before the peon class, as shown by the stock action - if I were guessing I'd say said "Goldman type folk" found out 4 sessions ago. But that's just me. 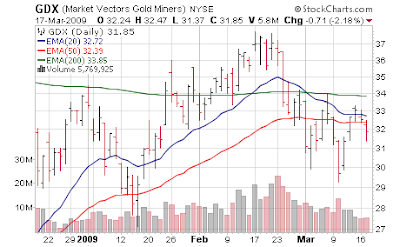 As you can see this general index of Gold miners did not show the same action as AU. When I did my analysis of gold miners (I'm a generalist and not a gold specialist) [Jan 30: Starting New Position in Kinross Gold] I chose Kinross Gold (KGC) which also has a relatively poor chart right now - but Paulson is the 4th largest holder of this stock as well. Again - not "fast money" but food for throught for the long run. If Uncle Ben is successful in his strategy to flood the world with so much currency that all assets must inflate (making everyone "feel" richer again) - then gold has a chance to have quite a run in the coming years.